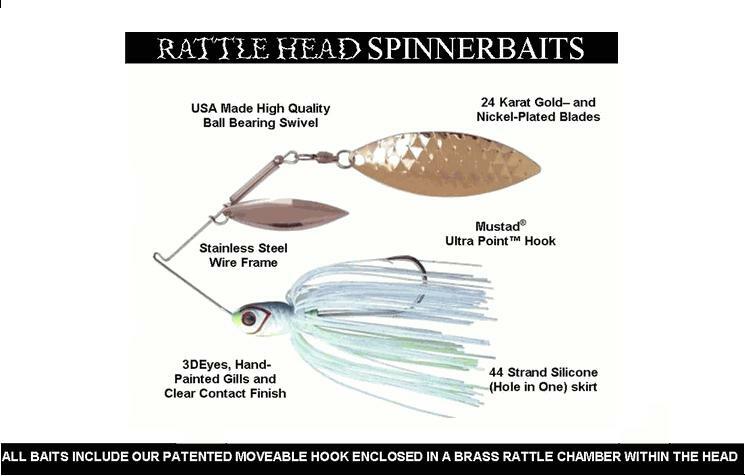 Rattle Head Bait's "Spinner Bait"
ProBassAnglers Finding innovation in spinner baits is nearly impossible yet this year at ICAST, the Rattle Head Bait company displayed it's Rattle Head Spinner Bait. At first look, a regular spinner bait. However, closer review shows a unique head and hook design, which actually allow the bait's hook to move side to side, giving the lure an in-the-water action has never been seen before. The lure itself features detailed attention to every aspect of the bait, from it's coloring to it's stainless steel frame, however the unique rattle chamber in the lure's head, along with the ability of the lure's hook to move side to side, enhances any trailer you use, resulting in a very unique swimming motion. There is also an added element of increased noise as the Rattle Head's "rattle chamber" emits a lot of noise in the water. The moveable hook also gives an angler an added advantage in fighting and ultimately landing a fish, as the hook's ability to move, takes away the leverage that a big fish will use to break your heart. Specifications-Available in the 3/8 oz and 1/2 oz sizes, the Rattle Head is available in any blade configuration you can imagine. Hand painted gills and a clear contact finish make the Rattle Head look lifelike, a 44 strand silicone skirt gives the lure bulk and adds to increase the water displacement.